Imagine the script to the Bourne Identity sitting on a table. Now imagine getting a big red marker, and starting to cross out things. First you lose all the great action sequences, which is a shame but there is still an intriguing mystery to be solved. Now take the red marker to that, and cross out until only the barest bones of the mystery are left in, and what’s left doesn’t seem to make much sense. Then with that red marker, flip to random pages and insert flashbacks, but not just one stream of flashbacks, multiple ones. It makes it better if they aren’t connected in any order at all. Then cross out most of the dialogue, insert quotes from Sun Tzu’s ‘The Art of War’, and then go on Wikipedia and look up quotes from every action film or political thriller, and mash them in there. You’ll also want to ram in an illogical side plot for best results. After that go to the front page, cross out The Bourne Identity and write The Way of War, go film it for a couple of bucks, and then chuck it randomly at DVD distribution houses. Congratulations! You have made a movie that isn’t worth watching! The Way of War is bad, very bad. Cheaply put together, poorly acted, and stagnantly directed. 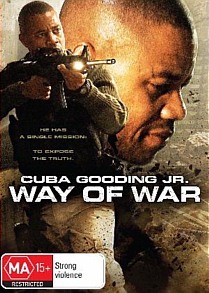 The plot revolves around David Wolfe (Cuba Gooding Jr), a paramilitary operative who returns to the USA after being declared dead in a mission to kill a Middle Eastern terrorist leader. The government immediately starts following him, because David is set on uncovering the truth about some massive political conspiracy. What follows is a boring confusing mess that feels awfully long for its 87 minute run time. Poor Cuba Gooding Jr must have made some devil’s bargain, because after the success of Jerry Maguire, he has gone from bargain bin to bargain bin churning out some of the crappier movies of the last decade. This probably isn’t even the worst one, which is a shame because he really did do some good work in Jerry Maguire. Here he isn’t so much bad, as just miscast. He doesn’t really ever seem believable as a hardened killer, and doesn’t really look it either. One scene, where for an inexplicable reason, he has to box a rather large intimidating fighter, Wolfe ducks punches over and over again like a cartoon animal before delivering a crushing blow that doesn’t even seem all that harmful. This scene is perhaps the pinnacle of laughable moments in this film, as in one fell swoop takes away what little hint of Wolfe being an incredibly dangerous human. As previously stated the film contains numerous flashbacks that are inserted at seemingly random points, probably to con viewers into thinking the film is cleverer than it is. In these flashbacks we see Wolfe the family man, and how it was all taken away from him. Actually that isn’t really explained at all but it does happen! We also see the “mission” that the operatives go on, which looks like three guys playing dress up in a gym locker room. With the small budget big action set pieces are obviously out of the question, but they mission plays out in such a way that it feels like it is of little to no importance. The best thing to do with The Way of War would be to walk straight past it and pick up one of the Bourne Trilogy, hell get all three. At least that way you will be watching a film about an incredibly dangerous man being hunted by his government and come out entertained. The Way of War isn’t even good enough to recommend as being a “so bad it’s good” type of film. Just put it down, and keep walking.